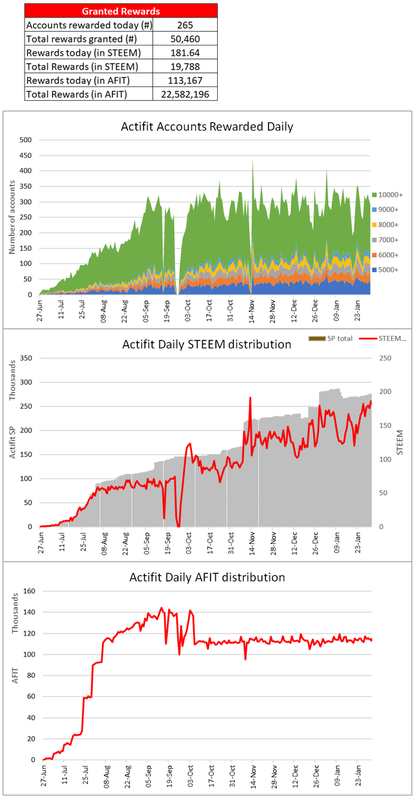 Welcome to my daily @actifit update with the overall Actifit and my personal statistics. All information is taken directly from the STEEM Blockchain. Let me start by welcoming our new Actifitters and wish them a lot of fun and health using the dApp: @duarte9sousa, @mamun123456, @ravindraojha, @gitanemuk, @delavibora, @pascale and @russia-btc. This section provides the results of today’s reward cycle. 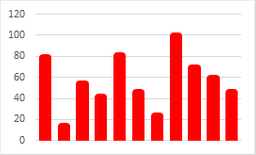 The tables and chart contain the Top 10 activity count, the category split used for the User Rank, totals of the day and the Mobile Phone OS breakdown. 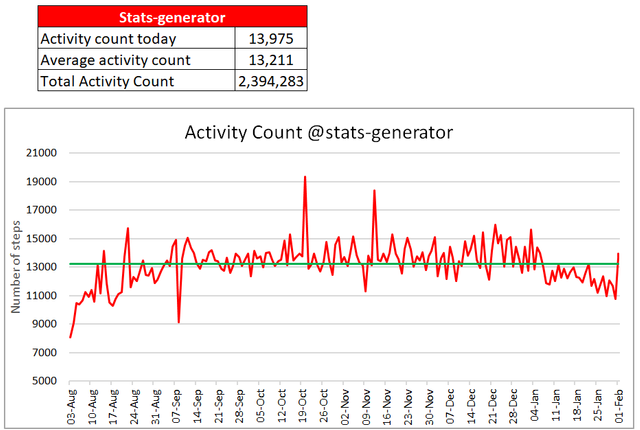 I would like to congratulate @mhm-philippines with the highest activity count of 40,622! In this section you will find the all-time results since the start of @Actifit. 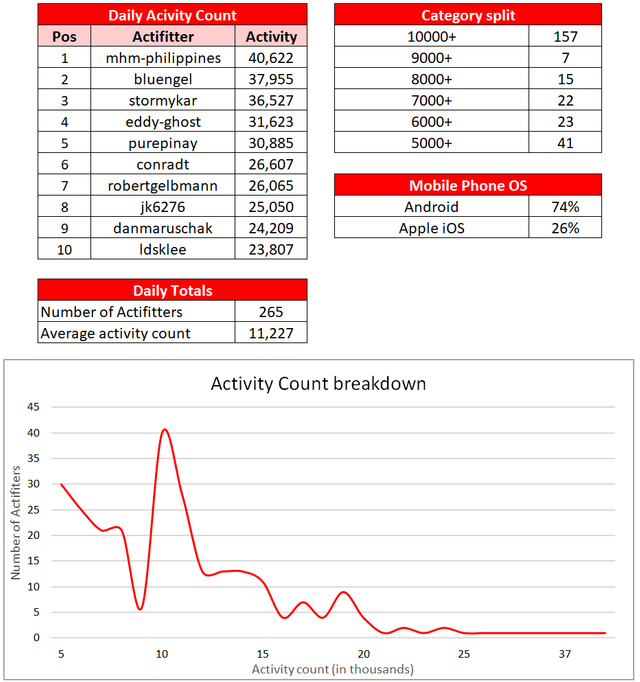 The tables and charts contain the Top 10 total activity count, Top 10 highest daily activity count, Top 10 daily number 1 positions, Total Top 10 positions, Daily Number Category positions, the overall Actifitter growth, Mobile Phone OS breakdown and the minimum&maximum activity count in the Top 10. Since the start of the project, @actifit has been providing rewards to users who posted their results. In the table below you will find the total granted rewards, the first chart illustrates the daily rewards development, the second chart the daily STEEM distribution to Actifitters, curators & beneficiaries via upvotes and the final chart the daily AFIT distribution for delegation, posts and upvotes. Finally here is the overview of my personal performance since I started with Actifit. This concludes my daily update, until the next time and keep Actifying! Nice count for yourself! Congrats! Thanks @mhm-philippines and hopefully many more number 1 positions for you! You have accordingly been rewarded 77.125 AFIT tokens for your effort in reaching 13975 activity, as well as your user rank and report quality! You also received an 6.87% upvote via @actifit account.